Above: Nifty certificate you can earn by participating in the GBBC. If you live somewhere in the United States and love birds you already know that Friday was the beginning of the 12th annual Great Backyard Bird Count (GBBC) which runs through Monday, February 16th. Read more at the Cornell Blog of Ornithology. Birdwatching might be a challenge for us here in Big Bear because of the current snow storm that is expected to last until Tuesday (actually it is a series of storms)…but I filled my feeder anyway to see who might turn up. I get to gaze upon a wide variety of birds because I live above a lake smack in the middle of the Pacific Flyway which means that I get to see a lot of birds that might not usually be found in the area. There are four broad, relatively exclusive flyway belts in North America. You can read more about the routes of migration or see a great North American Migration Flyway Map. 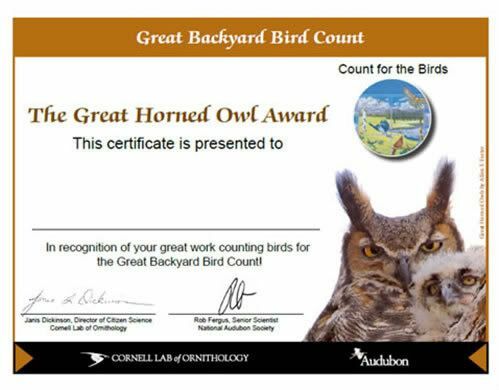 The Cornell Lab of Ornithology and the National Audubon Society host the GBBC event and in 2008 took in more than 85,700 bird checklists which is a vast increase compared to the 11,700 collected in the first year of the GBBC back in 1989. There are other great reasons for participating, in addition to the information gathered for science about the distribution of birds at this time of year each participant is eligible to win great prizes donated by Audubon, the Lab, Wild Birds Unlimited, and Droll Yankees. You can explore sightings being reported from your state, province, or all over the continent as they come in. Learn how to participate: Great Backyard Bird Count.